Every Sunday, Catholics gather together to attend Mass in memory of Jesus. At Mass we give God our thanksgiving, praise, and worship. We hear his Word and receive the Body and Blood of Christ. Participating at Mass is the most important thing Catholics do each week, for it is at Mass that we are changed, becoming what we have received in the Eucharist. The Mass charges us with an important mission—to be Christ in a world that is broken and in need of healing. This five part series for adults, teens and children explores the parts of the Mass in a deeper way, helping you to better appreciate the meaning of the prayers, responses, acclamations, gestures, signs, and symbols. From Mass to Mission will inspire you to be more actively and consciously involved in the Mass and in the world as Christ’s disciples. 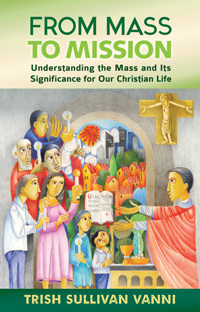 A limited number of booklets are available in the Faith Formation Office at St. Patrick's. Please call for information. What is your reaction to the ideas presented in each video? Which do you find compelling? Which does your parish live out well in their celebration of the mass? What areas could be improved? Chapter 1: Why Go to Mass? How is the mass both the source and summit of your own life? What does "full, conscious, and active participation" mean to you? ​What are the four ways Christ is present in the mass? How well do you prepare yourself for mass? ​What could you do, or what do you need to do, to make it easier to prepare both externally and internally? When have you heard the Word of God at Mass and had it "speak" to you directly? What do you need to be more open to the Word of God? What does it mean to you to know that it is Christ himself who speaks to you in the Word of God? Preparation of the Gifts: What do you give? Why? How do you participate in the the works of justice the community performs? How is your giving tied to works of mercy? Eucharist means "to give thanks," but gratitude is not just a feeling, but a form of action and outlook on life. What do you think of St. Augustine's idea that YOU are what is on the table at Eucharist? What does it mean to "be what you see; receive what you are?" How are you being called by the Mass to share the love of God with others? How does your parish community help to "build a world based on the values of justice, freedom, and peace?" What issues are happening in the world that your community could and should be in action on?